EMF-IncQuery has merged into VIATRA in 2016. This entry is only kept for backwards compatibility, all users are recommended to update to VIATRA as soon as possible. EMF-IncQuery is a high perfomance incremental graph search framework. With IncQuery, you can deﬁne declarative queries over EMF models, and execute them efﬁciently without manual Java coding (think SPARQL for EMF). The intuitive, Xtext-base query language is based on graph patterns that provide high (OCL-like) expressive power with a more concise, reusability-focused syntax that also supports integrating inline Xbase/Java. This versatile language is supported by a high performance query evaluation engine based on the Rete algorithm, known from expert systems. With this technology, EMF-IncQuery can provide real-time query evaluation performance (that is, instantaneous re-evaluation as the models change) for really complex queries over very large instance models (up to several millions of EObjects in size). 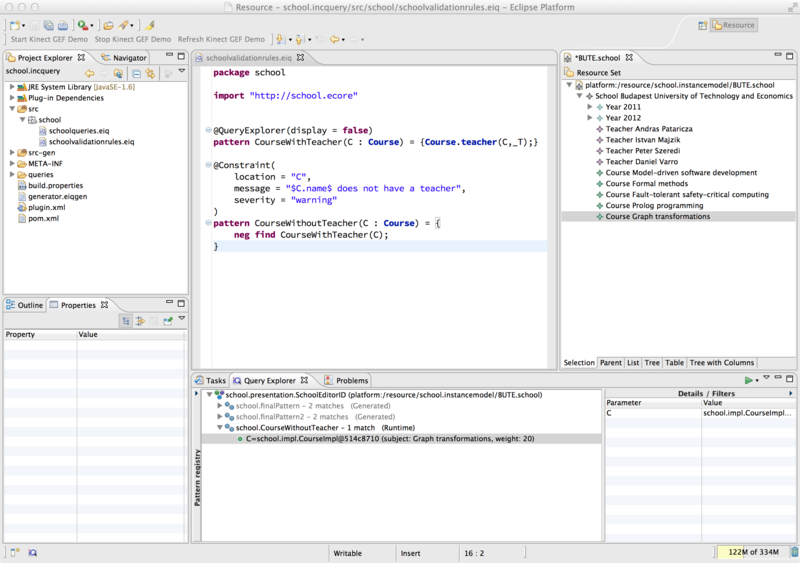 In addition to the model query features, EMF-IncQuery provides built-in support for the specification and execution of model validation rules that will be checked on-the-fly, and the specification and automatic maintenance of derived features (edges and attributes) that support EMF notifications out of the box. By adding the following code below to your website you will be able to add an install button for EMF-IncQuery.